In AD 350, in opposition to Magnentius who was marching eastward, Vetranio was declared Augustus by his troops in the Balkans. Vetranio remained loyal to Constantius II who was away fighting in the East. His types were issued in his name and in the name of Constantius II, and were continued in the name of Constantius II after Vetranio's peaceable abdication on December 25, 350, and in the name of Constantius Gallus after Gallus became Caesar in March 351. 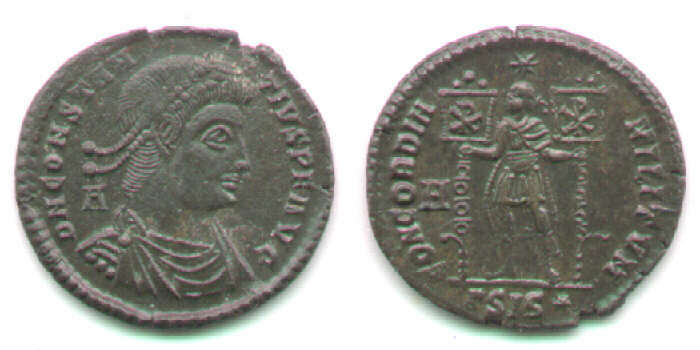 Official issue in the name of Constantius II. DN CONSTAN-TIVS PF AVG with A behind bust right, diademed, draped, and curiassed. S--, RIC VIII, Siscia 276, page 369. AE21 (4 mm smaller than the large AE2 original above -- these two images are on the same scale). 12:00. 3.30 grams. /CON [reversed]COR....MILITVM somewhat blundered, A in field left, B in field right. Mintmark a garbled "TS[reversed]H" which is an attempt at "TSA" for Thessalonica. Prototype: RIC VIII page 414, Thessalonica 130, which does has the same field marks on the reverse. Prototype dated 1 March - 25 December 350. Continue with the page on Magnentius imitations. Return to the page on FEL TEMP REPARATIO imitations. Return to the main page on ancient Roman imitations.